Steeling Hill Enclosure, near Coniston Cold (north-side). OS grid reference: SD 8859 5515. A large earthwork or enclosure located on the crest of Steeling Hill above the A65 near Coniston Cold, North Yorkshire. 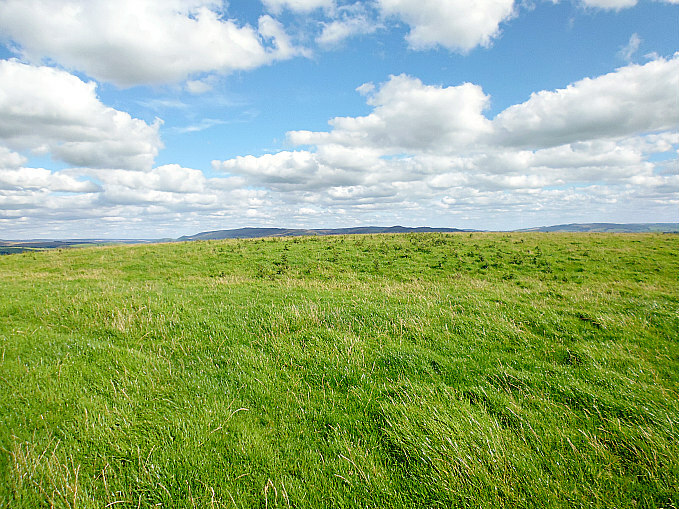 This flat-topped hill on the opposite side of the lane from Kelber Farm was once the enclosure, settlement or camp of an ancient tribe, but unfortunately nothing much is known of its history. It was almost certainly a strategically placed encampment overlooking the valley below and in this sense it may have been a defensive site, although its low, almost non existent outer ditch, is barely visible today at ground level. At its centre there is a round-shaped feature but what this was is uncertain. It might actually be a more modern feature. To reach the earthwork from the A65 just to the south of Coniston Cold: go along the farm track/footpath nearly opposite The Coniston Hotel towards Kelber farm for 240m, then on the right-hand side go through the gate and head up the grassy hill-side for 220m to a second gate. You can reach the site from here. There is, however, no proper designated footpath up to the hill; and so please remember to ‘fasten the gates’ behind you. 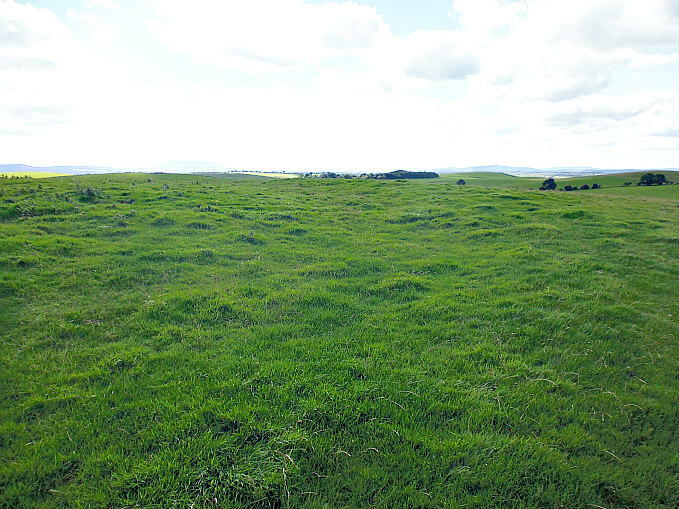 Steeling Hill Earthwork (from the south-west). 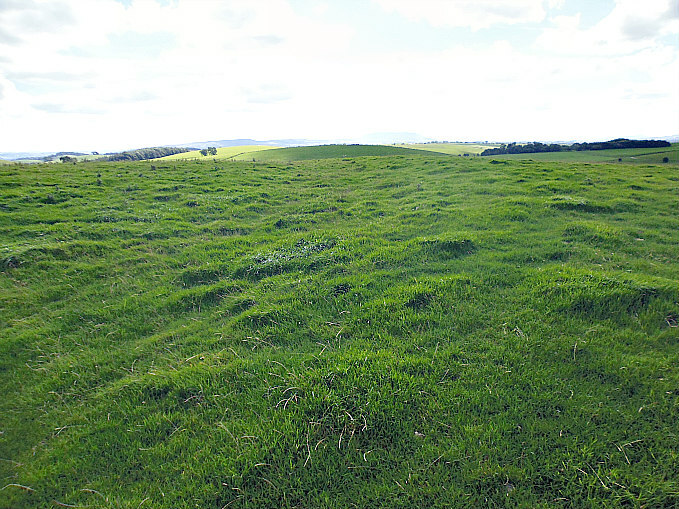 This very large rectangular earthwork on the top of Steeling Hill covers a large area of the summit and measures roughly 280m x 138m (918 ft x 452 ft), whilst the smaller, circular feature in the middle measures 74m x 60m (242 ft x 196 ft). The inner part of the earthwork/enclosure is raised by a few feet above the outer ditch, if it was ‘ever’ meant to be a ditch, but at the S and E sides this is much less noticeable. And as to the circular, slightly raised feature at the centre, and its distinct ditch – could this have been an inner enclosure, or maybe a living area with a hearth? Or could this be a more recent feature? So was this an Iron Age enclosure, or was it a Brigantian settlement?, or maybe something else; it looks to be an unlikely candidate for a Roman camp. Perhaps it was ‘a plain and simple animal enclosure’. But as ever there is a lack of any information regarding this earthwork, only the words ‘earthwork’ or ‘enclosure’ are mentioned on Ordnance Survey maps. There are though one or two other, similar, earthworks in this area, one in particular being near Cobers Laithe at Swinden, near Nappa. Categories: Earthworks | Tags: Steeling Hill Earthwork near Coniston Cold in north Yorkshire | Permalink.